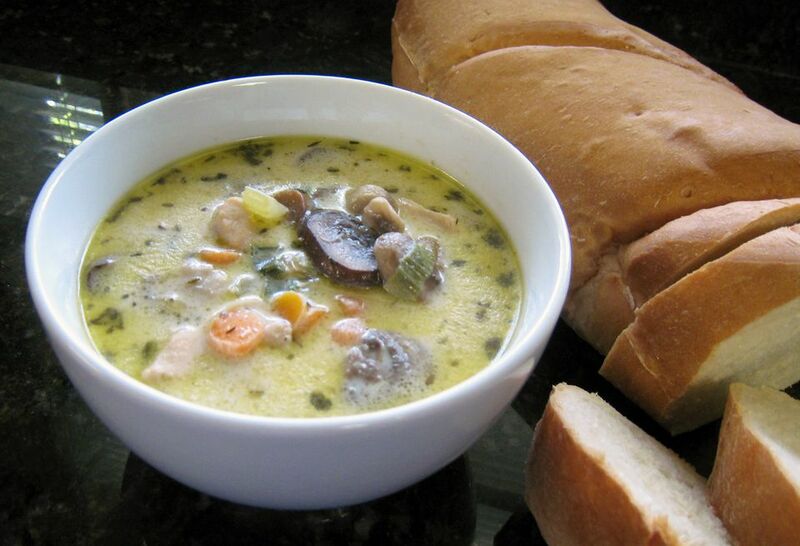 This creamy chicken and mushroom soup is full of flavor with diced chicken breasts, carrots, celery, and fresh sliced mushrooms. The heavy cream is added near the end of the cooking time. Serve the soup as a first course or serve it as a lunch or supper soup with a sandwich or salad. If you are using pre-cooked chicken, add it to the soup about 10 minutes before it's done. Feel free to make changes in this tasty soup. Use cooked turkey or chicken, but add it near the end of the cooking time. Or add some potatoes or rutabaga to the soup. Steamed peas may be added just along with the cream just before the soup is done. Place a large saucepan over medium-low heat; add the butter and olive oil. When the butter and oil are hot, add diced chicken, carrot, and celery; cook, stirring, until chicken is nearly cooked through. Add the mushrooms and continue cooking, stirring, until mushrooms are tender. Add the garlic and green onions and cook for 2 minutes longer. Stir in the flour until it is incorporated and continue cooking, stirring, for 2 minutes. Add chicken broth and thyme. Bring to a simmer while stirring. Cover the pan and reduce the heat to low; cook for about 10 to 16 minutes, or until the vegetables are tender. Add salt and pepper to taste; stir in cream and heat through. Add 1/4 cup of finely chopped onions to the pan along with the carrot and celery. Add about 1/2 cup of diced potatoes along with the carrots. Add about 1/2 cup of diced rutabaga along with the carrots. Use assorted wild mushrooms in the recipe or make it with soaked dried mushrooms. With fully cooked diced chicken or turkey: add cooked diced chicken or turkey after the vegetables are cooked. Cook for about 10 minutes and then add the cream and seasonings. Heat through. Add about 1/2 cup of steamed frozen peas along with the cream. Heat through.